The word ‘Nandan' has originated from Nandanvan, a land of abundance, the home of Lord Shri Krishna. Nandanvan according to Mythology is a land of perennial beauty and solace. It is a name that is deeply rooted in the Indian psyche. The name is Indian and yet on the whole the identity is modern and international looking. It appeals as a futuristic brand that aspires to grow big. 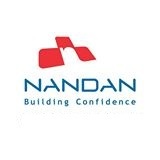 The Nandan logo draws its inspiration from values that are rooted in Indian Culture. The Identity has evolved from Building Blocks. Each of the blocks represents the 3 corporate values of Excellence, Ethical and Empower coming together. The symbol is modern and has an international look. The perspective gives it a strong dynamic feeling. The symbol exudes confidence and is very futuristic. To play a substantial role in defining skylines of places on the global map, by quality constructions. To build so as to create invaluable properties that add up to emotional joys and practical benefits.